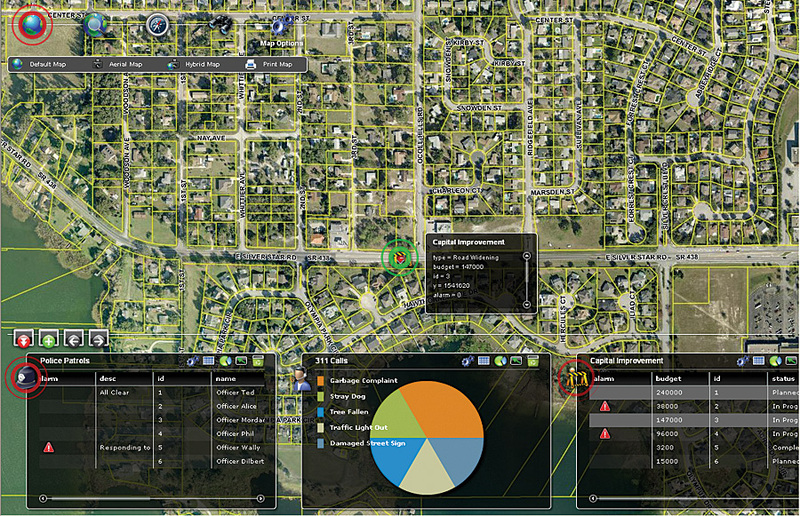 An executive dashboard mashup created with ArcGIS Server that provides city staff the ability to monitor the status of capital improvements, 311 calls, and police patrols. GIS-powered mashups empower users to solve real problems by incorporating the business knowledge and resource investments made by the organization and putting it in the hands of the decision makers and analysts who need to rely on trusted information. For example, a city government might build a mashup that focuses on vacant properties or brownfields to support community planning and economic development. In this case, parcel data might be combined with tools to analyze the development potential of a property based on different scenarios. 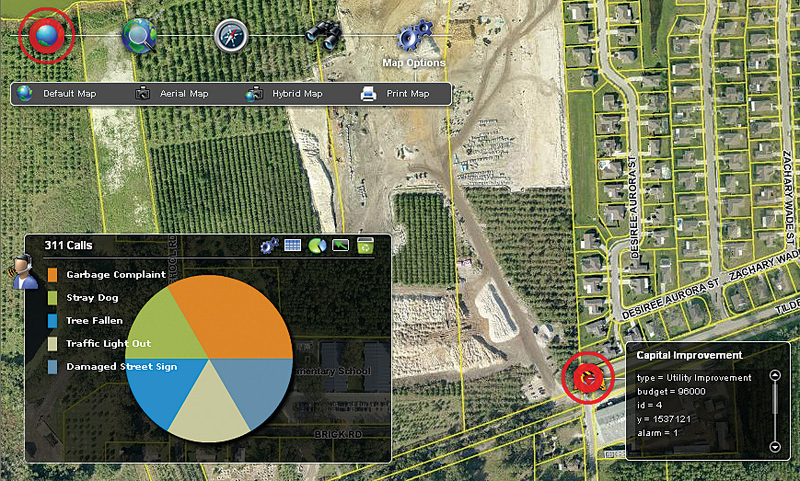 The tools would appear as a simple button or drop-down menu of choices but, when executed, would access internally hosted information, such as zoning, crime, and infrastructure, and perform server-side analytics on the GIS server. The user would be presented with a hot spot or graduated-color map highlighting the areas that best met the selected criteria. This type of mashup could be used at the front counter or on the desk of an economic development specialist to help engage business and industry owners interested in moving their operation to the community. It would provide access to authoritative data not readily available on the Internet. ArcGIS Server offers a rich set of tools to build lightweight Web applications. Until recently, mashups have been thought of as Web applications that aggregate data feeds from multiple Web services into a simple and often social or consumer-oriented Web application. Mapping mashups show the locations of points of interest generated from available services and GeoRSS feeds that contain spatial information, such as addresses or coordinates. Now, organizations are adopting the concept that mashups can be useful for conducting business and providing critical functionality to their users and business partners either over the Web or through internal distribution. 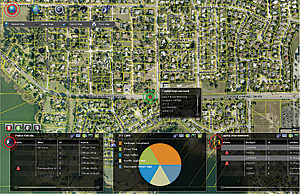 Enterprise systems, like customer relationship management (CRM) or asset management systems, can be coupled with ArcGIS Server services to provide business and government managers and analysts with unique access to their authoritative knowledge bases. This means that an enterprise mashup must efficiently and seamlessly blend the GIS platform with the organization's underlying systems architecture. ArcGIS Server gives organizations the ability to manage and deploy Web services for mapping, data management, and geospatial analytics. These ArcGIS Server Web services allow organizations to leverage their internal GIS resources, as well as services hosted on other GIS servers, and put them to work in enterprise mashups. Because ArcGIS Server is built on industry and Web standards to support service-oriented architectures (SOAs) and hundreds of data formats, organizations are provided with an integration platform for creating and managing enterprise mashups. Ease of integrationResearching the available APIs that best fit the user's environment and determining if any service-level agreements or licensing terms exist to use these APIs are important. Security and complianceConforming to identity standards and using authentication or authorization to protect data will involve support from the organization's internal information systems department. Quality of available dataEnsuring the integrity of the data, including how it is processed and how recently it has been updated, is crucial to the success of mashups, as well as identifying which internal content may be used so that proprietary data does not leak out. These issues should be considered right at the start of any mashup development rather than deferring them until after the project is under way. The new APIs available with ArcGIS Server 9.3 give organizations a rapid development framework for creating, deploying, and managing enterprise mashups. GIS-based services and applications can deliver portal-like access to internal information resources and enhance the accuracy and reliability of decision making, as well as extend the range of what a mashup can do. Enterprise mashups reduce dependency on services that are external to the organization.